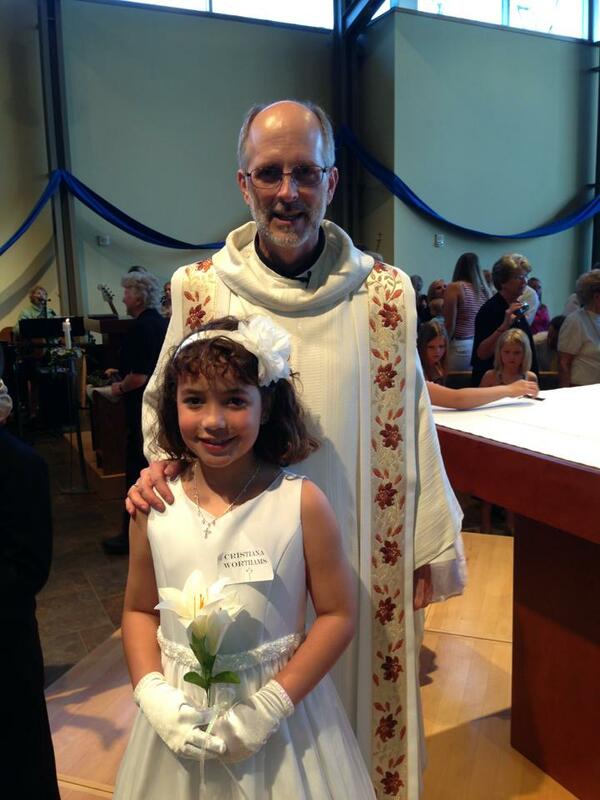 Hard to believe that my daughter, Cristiana, had her first Communion last Saturday. 7 years comes and goes so fast and I can hardly believe what a beautiful, smart, and genuinely kind-hearted person she has become. She has developed a faith and she’s very proud to show it. Needless to say, throughout the whole service, I was pretty emotional (or at least as emotional as I get). But what brought me to tears wasn’t directly related to Cristiana’s First Communion. It was Fr. Ken’s homily. Now, I’ve written about Ken’s gift of saying the right thing at the right time before. He has a gift of taking the complicated issues facing our society, our Church, our families, and ourselves and getting it down to words that easily capture the essence of it. He did it again for the Sixth Sunday of Easter, 2013. You can find the full homily at St. Tom’s website. Having religious practices is fine – but they aren’t the core of faith, they aren’t essential. Some people think St. Tom’s is not a Catholic Church because we don’t have the Stations of the Cross hanging on the walls – so were all the churches before that practice became common in the 18th century not Catholic churches? We certainly have wonderful practices that can enliven and express our personal faith – receiving ashes, lighting a votive candle, kneeling or prostrating for prayer, or raising our arms in prayer, even wearing a Roman collar or a habit. But they’re aren’t essential; the can and do change, just as the rules for eating changed in the early church. Even as I type this I’m having trouble keeping my eyes from watering. I am guilty of being one of those who haven’t attended Mass regularly. I’ll go with my family on Christmas, Easter, and other “big” days, but quite often I tried to sleep in or catch up on things at home on Sunday. Part of it is to avoid the statement, “Oh … we haven’t seen you in a while, Dave” (followed by a look of disdain). Part of it is because I’m in the midst of an argument with God about various things (some petty and immature, some more substantive). From almost the very start of this year, I’ve been angry with the Republican Party for, in my opinion, its ineffectiveness and it’s pettiness. It seems some days that moderates and “Tea Parties” can’t get together on anything. And it’s not because of policy … it’s because of personalities and an unwillingness to come together as a team. And I’m running out of patience with that. Too bad I’m stuck being the a local party chair for another 19 months (not that I’m counting). Some of what is separating us is related to the idea that we have to do certain things and we have to have certain practices to separate us from others. It seems that we get so wrapped up in these “practices” that we forget we exist to elect Republicans to public office. That’s our core goal. Everything else is insignificant to that. I am so happy that my daughter has reached a point where she can more fully participate at the Lord’s Table with the rest of us. I am so proud to call St. Tom’s my church home, even though I don’t go there every week. I am happy that it’s OK for practices to change without taking away from the core idea that our relationship with God (and with one another) remains at the heart of what we do. That’s where we find peace.